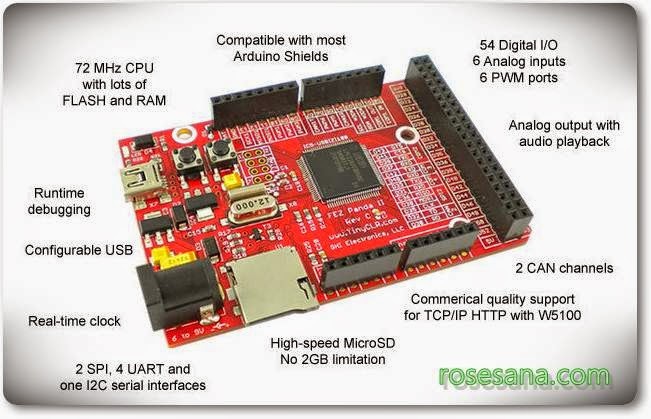 Based on NXP's LPC2387 micro-controller with GHI's commercial USBizi firmware/software package. 512 KB Flash (148KB for user application) . 96 KB RAM (62KB for user application). 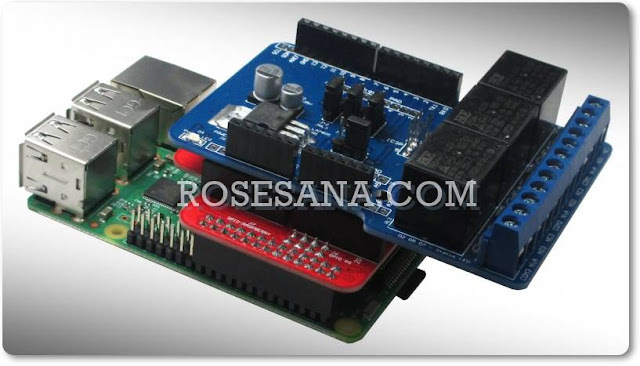 Compatible with most Arduino shields. USB device connection for run-time debugging. Specialized libraries to configure USB port to emulate devices like thumb-drive, virtual COM (CDC), mouse, keyboard. USB Debugging and Virtual COM (CDC) can work simultaneously. USB Host support with modifications. Built-in Micro SD card socket (4-bit high speed SDHC support, no 2GB limit) with card detect signal. 10-bit analog output (with audio WAV playback). Configurable on-board LED and button. 4x UART serial ports (one with hardware handshaking capability). OneWire interface (available on any IO). Built-in Real Time Clock (RTC) with the suitable crystal. OutputCompare for generating waveforms with high accuracy. RLP allowing users to load native code (C/Assembly) for real-time requirements. Ethernet support through W5100 chipset with full TCP, UDP, HTTP, DHCP and DNS support . Ethernet throughput is 400Kbps. Perfect Match for FEZ Connect shield. Parallel Port (ideal for color displays). JTAG is exposed (available only when firmware is erased). Low power and hibernate support. In-field update (from SD, network or other). Digital I/O are 3.3V but 5V tolerant. Low power and hibernate modes. Active power consumption 103 mA. Idle power consumption 65 mA. Operating temperature: -20 to 65°C.